There is more information available on this subject at Venus on the English Wikipedia. "Sunlight starves. The fierceness chills and thins and runs sweet. A new ocean emerges, thick and salty and hot, from springs and geysers that drench the dead ground. You wonder: will this world's second birth be its finest?" Venus is the second planet in the Solar System, and the largest terrestrial planet apart from Earth. It is also a living consciousness, and one of the Nine. With the coming of the Traveler, Venus' toxic air was 'cleansed' and the world was swiftly colonized by humanity during the Golden Age, becoming known as a "paradise". Venus is now a hostile world. Sulfuric gasses are vented from the surface of the planet,  and crackling lightning flashes through the sulfuric yellow sky. All the while, jungle and overgrowth has claimed the remnants of the scientific research settlement once held here by humanity. The ruins of Venus feature energy relays used by the Vex, which are powered by a heavily protected Nexus far below the surface and are believed to be part of an ancient network that, if fully reawakened, could turn the planet itself into a system the Vex could control. Both the ancient Vex ruins, and the more recent human structures are now choked in vegetation, although humanity has managed to regain a presence there. But despite this, the forgotten cities are slowly being swallowed up by the Venusian ocean and in their place; the towering Vex Citadel now draws the eye—a hulking, obelisk Jenga tower of bizarre geometric shapes. Its purpose remains unknown, but the robotic Vex unceasingly defend it. The Fallen House of Winter also has their Lair on Venus, adding to the number of hostile forces already present on the planet. During the initial exploration of Venus, ancient ruins predating humanity's existence were discovered, leading to a colonization rush by some of Earth's brightest minds. Following the Collapse, the Vex lay claim to those ruins and began protecting them for unknown reasons. The Ahamkara had a strong presence on Venus during the City Age, and appeared to be engaged in terraforming the planet for unknown purposes. The nature of the changes wrought by the Ahamkara are unclear; according to Eris Morn, eyewitnesses disagreed over what they saw, or the order in which events had occurred. 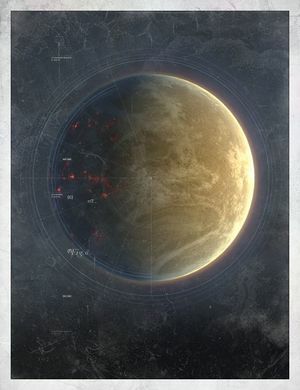 During the Great Ahamkara Hunt, a "paracausal phenomenon" appeared over the Ishtar Academy which prompted at least one Guardian who witnessed it to apparently attempt permanent suicide. Ultimately, the Ahamkara were exterminated on Venus by the Guardians, although their skeletal remains continued to telepathically influence those who encountered them. The Ishtar Sink is placed somewhere along the southeastern coast of the Ishtar Terra, one of four highland continents of Venus and just south of the north pole. A Vex portal on Venus. A postcard from Venus during the Golden Age.